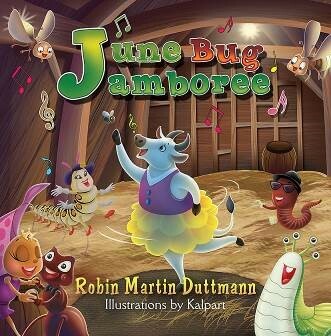 ONTARIO, Ontario - Aug. 22, 2014 - PRLog -- Strategic Book Publishing & Rights Agency is pleased to announce the release of its newest title, June Bug Jamboree, by author Robin Martin Duttmann. Country hoedown is right! Listen to the music, as the bugs (and other creatures) celebrate summer by square dancing, singing, and swaying to the music at their June Bug Jamboree. This fun children’s bookfeatures a country bug hoedown that captures the glory of a sweet summer festival. Children will want to clap and sing along to the book’s wonderfully illustrated, catchy country tune! The hoedown takes place on a warm summer night in an old country barn down a dusty dirt road. The stars are shining, the music is playing, and the smell of deep-fried chicken and freshly baked pie lingers in the air. Remember: It doesn’t have to be June for June bugs to party! Robin Martin Duttmann of Amherstburg, Ontario, is an educational assistant with the Catholic School Board. She enjoys her career working with children with varying exceptionalities. She loves to read, write, sail, and spend time with her friends and family. June Bug Jamboree is her second published work. Her first book Zoo on the Moon received Honorable Mention at the 2013 Purple Dragonfly Book Awards, and is now part of the curriculum for the IBLIBRARY Primary Years Program. http://sbpra.com/RobinMartin-Duttmann or at www.amazon.com or www.barnesandnoble.com.